The next meeting of the Huffman Prairie Aviation Historical Society will take place on Monday, August 6, at 7:00pm. All are welcome! Brody Beaver, a native of Grove City, Ohio, is currently a Wright State University senior majoring in Mass Communication and a staff sergeant with the United States Air Force Reserve. He is also a licensed pilot, for both planes and drones, and a Wright Brothers enthusiast. In March of this year, Brody, a regular SC&A researcher, wrote a guest blog post on flight logs, which it can be viewed here. 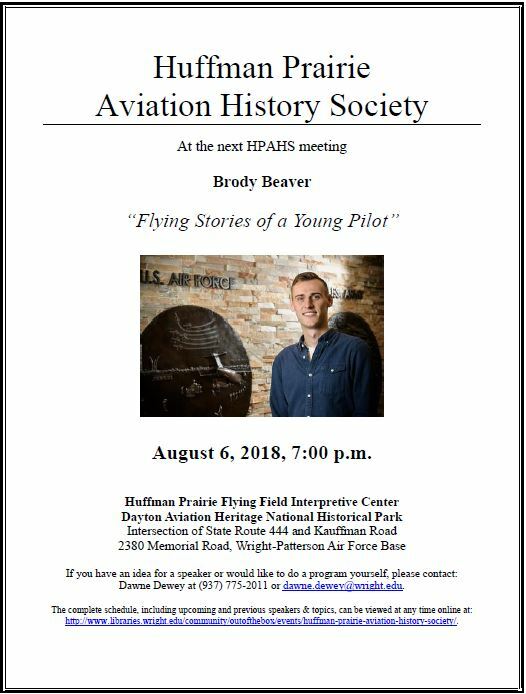 This entry was posted in Outreach and tagged aviation, Brody Beaver, HPAHS, Huffman Prairie Aviation Historical Society. Bookmark the permalink.